BenjaminWoo.net > News > Will the “Real” Nerds Please Stand Up? Apr 9 Will the “Real” Nerds Please Stand Up? In typically nerdy fashion, users krib and Benoit from Ottawa refer to an authoritative source, discussing a wikiHow instruction set on telling the difference between nerds and geeks. These are all examples of what might be called “folk sociology” or “lay theory.”† One of the unique things about the social sciences in contrast to other branches of knowledge is that the objects of our research are themselves active, thinking subjects. That is to say, every human being is a kind of social theorist in a way that no animal is a zoologist and no rock is a geologist. People are always analyzing, classifying, and explaining the world around them. Folk sociology is not always explicitly formulated—or when it is, it may well be very contradictory—but it is implicit in our ability simply to get on with our lives. From the point of view of “formal” or “academic” social science, lay theory often gets things quite wrong, but its errors, contradictions, and lacunae often point to real problems that professional theorists need to take account of. In this case, the Radio 3 listeners’ attempts to clarify their usage of nerd gets at a real definitional problem. Namely, we have come to use the words nerd and geek in two very different ways. Ever since computers became so important in our lives, the words nerd, geek and dweeb have undergone an almost complete reversal of connotation, from negative to positive[....] A geek no longer means someone with no social skills, but someone with specialized knowledge. People say, for example, ‘I’m a wine geek’ to mean ‘I’m middle class,’ or ‘I’m a finance geek’ to mean ‘I’m quite rich.’ People proudly say, ‘I have these dweeby interests’ to mean ‘I’m educated.’ The phrase ‘geek chic’ has become so overused in magazines it almost means simply fashionable. On the other hand, they’re still used in relation to a more specific conception of nerd culture, the “nerdy” interests that Caedus, above, associates only with geeks, and with certain stereotypes about their character and interpersonal style. The relationship between these two uses is very much an open question, but it seems to me that when lifestyle reporters and op-ed columnists say that it’s now cool to be a nerd because Bill Gates is a bojillionaire, no one really is fooled into thinking Bill Gates is cool. 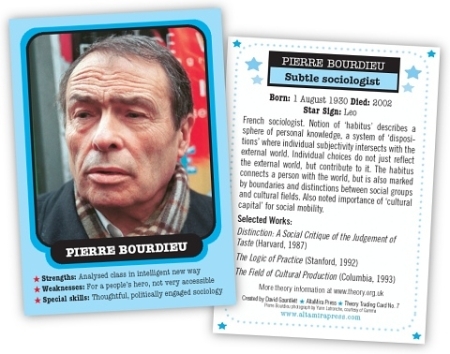 Pierre Bourdieu was the great theorist of classification. In his well known book on aesthetics and cultural consumption, Distinction,‡ he demonstrated that our tastes in music, art, food, decoration, and so much more, which we often understand as expressing something deeply true about us, are distributed unequally through the social field—in particular, they are correlated with class positions. For Bourdieu, classification, or naming, is a fundamental social process. Nothing is given to us that we haven’t already classified, and those classifications always have causes and reasons that are located, at least partly, “outside” of ourselves. Applied to the case of subcultural groups like nerd culture, “struggle” is perhaps too strong a word, but what Bourdieu is getting at is that the authority to define a group—what it means, what counts as “authentic” or “inauthentic” participation , who’s in and who’s out—is exercised by people who have a stake in the game. For some, maintaining the group as it is is the most profitable strategy, allowing them to stay big fish in a small pond or at least to feel that they have a place in that pond (in my research, I call these people introverts); for others, expanding the boundaries of the group—mainstreaming it distinctive practices—is more likely to pay off, especially if they are able to present themselves as its legitimate spokespersons (these are the extroverts). I’m reminded of the case of Toby Radloff, a former public servant from Cleveland, OH, who appeared off and on in the pages of his co-worker, Harvey Pekar’s independent comic book, American Splendor. Inspired by the 1984 film Revenge of the Nerds, Radloff began to bill himself as a “Genuine Nerd,” and he made appearances on MTV, a local cable access show, and in the cult films Killer Nerd and Bride of Killer Nerd. So, who should you ask what it means to be a nerd—the kids at the indie rock show? A dot-com millionaire? The nth attractive celebrity claiming to be an ex-dork while promoting their next big-budget, special effects extravaganza? Or, should you ask someone like Toby Radloff? It makes all the difference. Will the “real” nerds please stand up? *Contemporary hipster and nerd cultures obviously have a lot in common. Some points of convergence include trivia as cultural capital, gadgets, and a similar canon of nostalgic childhood reference points. With their predilection for gigantic plastic glasses frames and narrow-legged, too-short trousers, hipsters have recently come to resemble former stereotypes of nerdy dress (i.e., Jerry Lewis in The Nutty Professor), but they don’t look an awful lot like most black-tee-and-jeans nerds that I know. †A book I’m currently reading, Andrew Sayer’s Moral Significance of Class (Cambridge University Press, 2004), has some very interesting discussions of lay concepts (in this case, those of class) and of the moral ideas that stand behind them. ‡Pierre Bourdieu, Distinction: A Social Critique of the Judgement of Taste, (Cambridge, MA: Harvard University Press, 1984). **Pierre Bourdieu, “The Social Space and the Genesis of Groups,” Theory and Society 14 (1985): 731–32; emphasis in original.